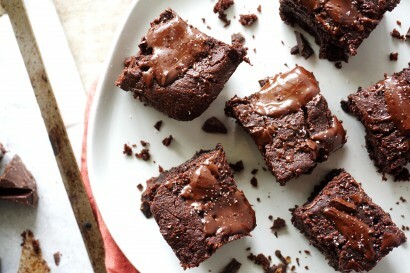 The Best Vegan Date-Night Brownies | Tasty Kitchen: A Happy Recipe Community! 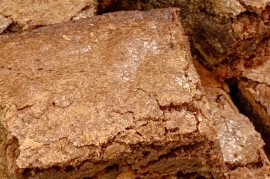 Imagine the very best brownies you’ve ever had. 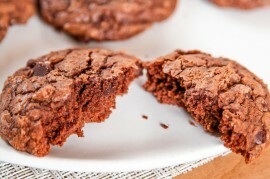 Now, imagine a brownie even better than that and one made with all wholesome ingredients. 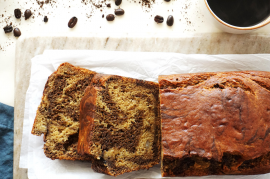 That’s where The Best Vegan Date-Night Brownies come in! 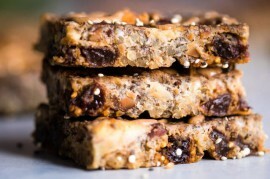 Seriously, these are top-notch, and made with coconut flour, almond butter, dates, and dark chocolate. Preheat oven to 350ºF and lightly grease a 9×5 baking dish with oil. Set aside. In a small ramekin, whisk flaxseed meal and water, and set aside for 5 minutes to thicken. 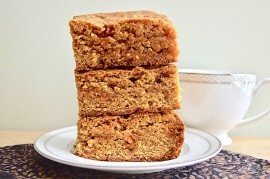 This is your flax egg. Melt 3 ounces of dark chocolate in the microwave in a small microwave-safe bowl. 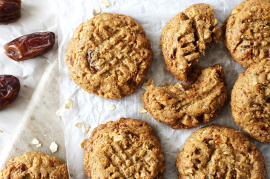 Pour into a high-powered blender with almond butter, soaked and drained dates, and flax egg. Pulse to combine, then blend for a few seconds or until dates are no longer chunky. Add vanilla extract, coconut flour, sea salt, and baking soda. Pulse again to combine. Transfer batter t greased baking dish and top with remaining dark chocolate chunks. Bake at 350ºF for 20–22 minutes. You may need to perform the toothpick test in a couple spots throughout the brownies to make sure you aren’t hitting a chunk. 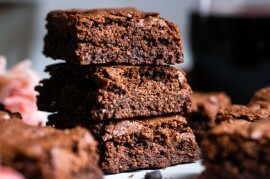 When the toothpick comes out with just a few crumbs on it, remove the brownies from the oven and cool them completely (at least 1 hour) before cutting and serving. Store leftovers in an airtight container in the fridge for up to 2 weeks. Enjoy!